Our property pays homage to the lone grape vine that has stood on the property for over 100 years, making it the second oldest vine in Monterosso. The property was also once owned by the locally famous artist Raffaele, whose iconic depictions of Monterosso can be viewed at various locations around town. 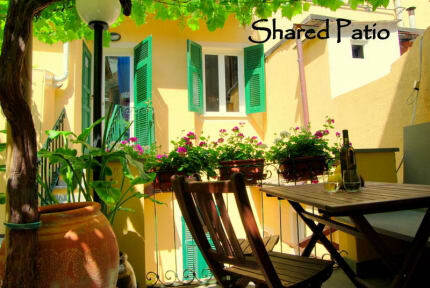 Our reasonable rates allow all types of travellers to experience the tranquillity of a home away from home while exploring the enchanting Cinque Terre. We have two types of accommodation options, a complete apartment or a single room. Our apartment options include a complete kitchen, bathroom, and living area. Our single rooms have a twin bed, small table and chair, sink, mirror and storage space. The single rooms share a detached bathroom with a sink, mirror, shower and toilet. All guests are provided with linens and towels. We also have a laundry line to dry any items during your stay. High-speed wireless internet and cable tv are also available with certain accommodations. Our rooms are all recently renovated, creating clean modern spaces within the beautiful historic buildings of Monterosso. Our thick stone walls help to keep the rooms cool in the summer and warm in the winter. Each of our accommodation options feature unique architectural highlights, some of which include high wood beam ceilings, marble accents, or hand-moulded details which were created by Raffaele himself. 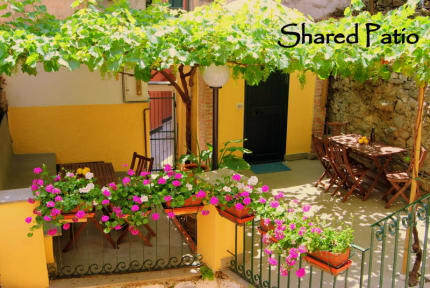 Our property also has a communal patio space which creates a perfect environment to socialize with other guests or relax quietly under the shade of our vine. A Vigna du Raffa offers complete customer service, assisting our clients both prior to and during their stay in any way possible. A Vigna du Raffa is owned and operated by a young Italian guy (Diego) which helps us to accommodate our international guests as he speaks both fluent English and Italian. We are also affiliated with one of the private beaches here in Monterosso, and offer our guests discounted access to beach beds and umbrellas.